Headquartered in Washington DC, the American Bankers Association is the voice of the nation’s $15 trillion banking industry, which is composed of small, regional and large banks that together employ more than 2 million people, safeguard $11 trillion in deposits and extend more than $8 trillion in loans. 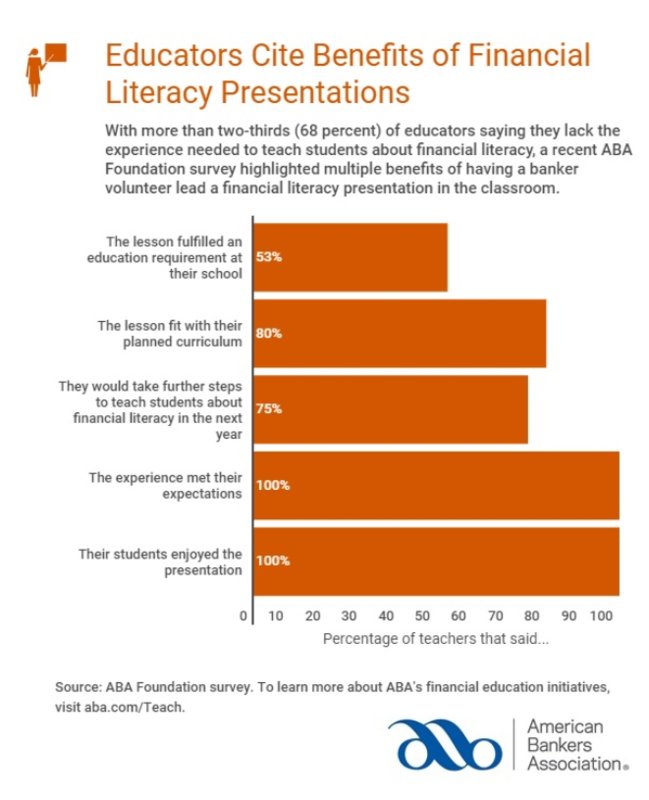 Through its leadership, partnerships, and national programs, the ABA Foundation, has been helping banks improve their communities through financial education since 1925. The Foundation’s financial education programs engage banks of all sizes and charters, from large multinational and regional banks to single-branch community banks. Teach Children to Save (TCTS) is a national campaign geared toward grades K-8, that raises awareness about the importance of developing a savings habit, which is the foundation for a strong financial future. Each April, and throughout the year, bankers nationwide employ real-world knowledge and professional expertise in classrooms, youth centers, and after-school programs. The goal: help young people gain a better understanding of saving, spending wisely, and the power of choices. Contact your local banker to bring financial education lessons to your classroom or community group by completing a request form at www.aba.com/FinEdLink. Now in its 17th year, Get Smart About Credit (GSAC) is a national campaign that engages around 4,000 bankers annually to help teens and young adults learn how to use credit responsibly. Free lessons cover protecting your identity, knowing your score, paying for college, managing your money and two new units meant to inspire youth to pursue one of the many diverse career opportunities offered by the banking industry. Visit www.aba.com/FinEdLink to request a banker-led personal finance presentation. This video competition encourages middle school and high school students age 13-18 to use the power of video to communicate to their peers the value of saving, using money wisely and paying for college. Lights, Camera, Save!videos provide unique financial “edutainment” infused with the vision and creativity of youth. Banks host the local level of this contest and select a winner to compete at the national level for prizes worth up to $5,000. View 2018-2019 national winners’ and finalists’ videos. Subscribe to our Spirit of Banking newsletter for more information. Like American Bankers Association Facebook page. Follow @ABABankers for the latest tweets from the ABA. Follow American Bankers Association on LinkedIn for thought leadership in banking.